Live your tropical island fantasy on Namotu Island Resort. 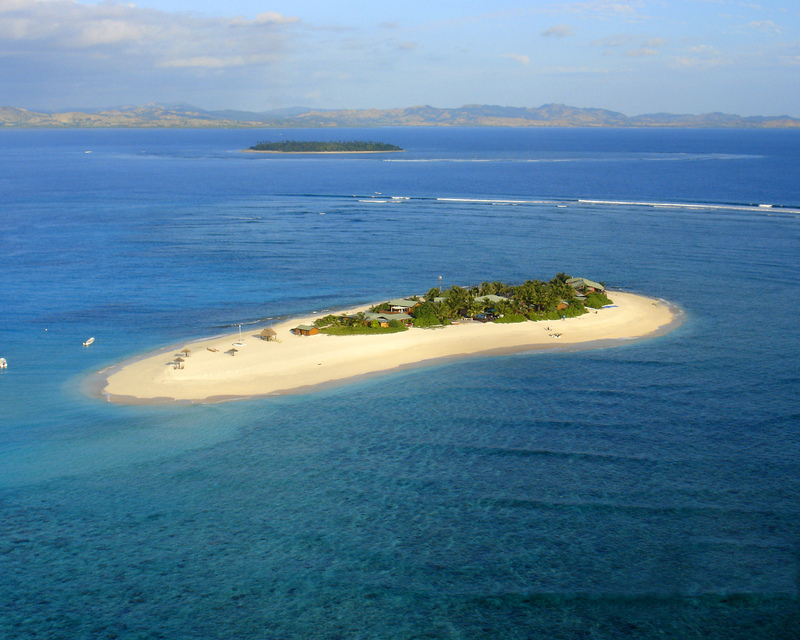 Go fishing or diving, try kite surfing, scuba diving or just relax on this perfect Pacific paradise. Namotu Left is a world-class reef break just offshore and world famous Cloudbreak is just a short boat trip. – see Fiji Surf. The biggest surf hits from March to November. For the cleanest, least crowded waves, try the wet season (December-February). March- April-May and September-October-November can get glassy conditions with south swells. Namotu Left is a world-class reef break that works on any swell. From 2 to 6 foot, it’s a fantastic fun wave; from 6 to 15 feet, it can be the thrill of a surfing lifetime, and just a little more forgiving than the famous Cloudbreak. For a real fun wave, try Swimming Pools, a right-hand reef break with just enough power, good speed, a nice barrel and a big cut back. About a kilometre northwest, Wilkes Pass is a powerful right barrel that breaks on the tip of a long reef. This is one serious wave, especially as it approaches the 10 foot mark. Further northwest, Desperations is a right and left peak that breaks off a point on even the smallest swells. And of course there’s Cloudbreak, Restaurants and Tavarua Rights. The traditional shared “Fijian Bure” for a group of up to six mates or individual travellers. Three “Beach Bures”; built in Fijian style with high ceilings, hardwoods, and lots of windows to take advantage of the sea breezes. The five newer “Pacific Bures”; “Sunset Bures” and “Love Shack”, all stylishly designed to a premium resort standard. In addition, there’s The Villa, a complete house with 2-3 bedrooms, living room, bar and its own pool, perfect for a family or a small group of friends. All bures have air conditioning, ceiling fans and attached bathrooms. Namotu Island Resort presents unique daily menus incorporating international cuisines and the finest, freshest local seafood and tropical fruits. All meals are served al fresco – breakfast and lunch overlooking the waves, dinner under the stars. The fish is as fresh as fish gets, featuring yellowfin tuna, wahoo, walu, mahi mahi and giant trevally. They also offer prime Australian grass fed beef and New Zealand lamb. The Namotu bar is close by, with original cocktails, a fine selection of international wines as well as local and imported beers. The underwater world is a fantastic attraction, even just snorkelling in the shallows. Serious divers thrill at the unspoilt corals and abundant marine life. As well as coral trout and reef fish, eagle rays, pilot whales, and turtles can be seen on dive trips a short boat ride from the island. Namotu’s 29-foot fishing boat does one or two trips a day, to troll for wahoo, Spanish mackerel, mahi mahi and yellowfin tuna, which our cooks will prepare for sushi or a barbecue. Each week Namotu Island invites our guests to participate in a traditional Fijian Meke, with music, south Pacific dishes and of course a kava ceremony. For relaxation, you can lounge by the pool, indulge in a massage, catch up on your reading, or play ping pong, snooker or darts. A short island hop takes you to the main island for sightseeing or a game of golf. Atoll Travel offers fully inclusive tour packages to Namotu, with return air fares to Fiji, airport welcome and transfers to and from the resort. Package includes all airport, hotel and departure taxes, but not any additional airline charges for boards/board bags. Trips are 7 night; Saturday to Saturday; the usual itinerary is to fly from Australia on a Friday; have a night at a Nadi hotel and then transfer out to Namotu on Saturday morning. Alternatively there are sometimes overnight flights arriving to Nadi early Saturday morning or Saturday flights providing they arrive to Nadi by 3.00pm at latest. On the return guests leave the island on Saturday morning and take an afternoon flight arriving back in the evening. Tour packages include accommodation in an air-conditioned bure, with three full meals per day (drinks extra); unlimited boat transfers to the surf breaks and the experienced surf guides will help guests decide which breaks are the best each day depending on prevailing wind, tide and swell conditions. Also included is the use of the resort’s recreation facilities and equipment and some fishing excursions. Extra charges apply for massage and diving trips.